WE ARE IN A MULTIPLE OFFER SITUATION. HIGHEST & BEST DUE BY 5PM 4/26/18. 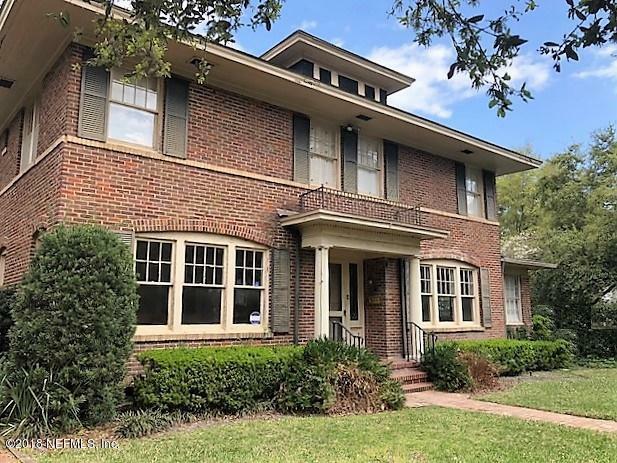 Occupied by three generations of the same family, this venerable 1926 historic Grande Dame stands just one lot from the St. Johns River on one of the finest streets in Jacksonville! Enter to a grand staircase flanked by the formal living room with fireplace on the right, and a sunroom with river views beyond. A formal dining room, kitchen and large family room with fireplace complete the downstairs. Lovely brick patio in the back yard. High ceilings, original hardwood floors & loads of historic architectural detail throughout. Upstairs are 4BR/2BA, 2 fireplaces, closet space galore, and a stately landing w/ hand carved banister. 1BR/1BA garage apartment over the 2-car garage. Your masterpiece is waiting to happen!